Who are the installers at my home? What is their training? All of our installers go through a rigorous hiring schedule. By the time we hire them, we know that they have the desire to make our clients happy and that they share the same values as us. Job shadowing and apprenticing is also a key component to our successful training. Are they insured and properly licensed? Liability insurance protects your investment in case of the worst case scenario. Additionally, it is imperative that all people working on your home be insured for health and safety purposes. We offer a full array of payment options. For your convenience, we accept cheques, phoned in Visa/Mastercard and recently the addition of payment online using Visa/MC/Paypal. For larger jobs, we offer the convenience of paying a 25% deposit with 50% more paid half way through the job and the remaining 25% paid upon final client approval of a job well done. What do other people say about the company? Ask around and chances are your friends or a friend of a friend has used our services. What are they saying? Additionally, check out the testimonials and references. If a company cannot produce such a request, it is likely their past clients were not happy with the results. It’s seems as if the last holiday season was just here and yet the next one will soon be upon us… how time flies! But for those of us who love Christmas, it can’t come too soon! Realistically plan out ahead of time what you can comfortably spend. This can greatly relieve the financial stress that so often goes hand-in-hand with Christmas. Of course you will need to tweak it as you get closer to but this is a great starting point. Be careful to choose the right products. Here at Light Knights Lighting, we use only quality lights that will guarantee your satisfaction. We carry LED lights exclusively which will go a long ways towards saving on your electrical bill. These lights come in a variety of colors and will last much longer than incandescent lights. Getting an early start on Christmas preparation will pay big dividends by maximizing the joy of the holiday season for you and your family. By starting your planning early, you will build the anticipation of that magical time of year. You can expect this Christmas to be the best ever! It’s hard to believe that Christmas is just over 3 months away! If you haven’t already done so, you will want to think about booking a time to have your Christmas lights installed. It is best to have this done early so that you can get maximum enjoyment from this magical time of year. Here are a few frequently asked questions to consider as you make preparations for the season. Q: How do you hang Christmas Lights? A: We have many tips and tricks to professionally hanging lights, leaving them straight and uniform. The most commonly used methods are clips, ties, clear line and staples. Q: How much energy do my lights use? A: This varies per job and amount of lights used. Light Knights are proud to be environmentally friendly and use almost strictly LEDs which use 80% less energy than incandescent bulbs. Q: What is the difference between C6, C7, and C9 bulbs? A: C6’s are versatile all purpose bulbs for indoor and outdoor decorating projects, measuring slightly smaller than the C7’s and are a fixed base bulb. C7’s can be removed from the base and changed out for custom color variations. C9’s are the biggest bulb measuring just under 3” and are also interchangeable. They are great for gutter and roof lines, being highly visible from further distances. Q: What’s the difference between LED and incandescent bulbs? A: This topic gets quite extensive and is explained in further detail on our website. The quick answer is, LEDs are much more energy efficient using up to 80% less energy than incandescents. LEDs last longer as there is no filament to burn out and are more durable. Q: Will the string still work if one bulb burns out? A: Yes, but there are exceptions. If the shunt (base) is still intact and the series hasn’t been compromised, the string will still work. If the shunt has been broken and power flow has been interrupted, that string will not work. Light Knights is proud to offer Commercial Christmas light installation services. We work with Churches, Schools, Colleges, Universities, Malls and businesses of all shapes and sizes to brighten up their holidays and special events. Did you know adding lighting to a store front can make a significant impact on holiday business? Drawing customers into your place of business can be difficult during the holiday season as the competition for shoppers increases. By adding a light display you can dramatically increase the likelihood of people seeing your business and therefore taking a look at what you have for sale. Let us work with you to create a unique display whether it is lighting up exterior trees, roof lines, windows, or the inside rafters. No job is too big or too small and our design team will work with your company to provide a basic, less-is-more setup all the way to an extravagant, impossible-to-miss lighting system. Check out Commercial Christmas Light Installations we have done for Save On Foods, Blenz, and UBC in our picture gallery. So you want to install Christmas Lights on your home or business’s trees. There are a number of ways to decorate trees and we will discuss each method in detail today. Among the most popular are what we call globe wraps. This is done by starting at the bottom of the tree and wrapping around it in a horizontal manner, resting the strands on the appropriate branches, with the required amount of slack. Using a step ladder or extension pole helps to get the strands up tall trees. Both evergreens and deciduous trees are great for globe wraps. Deciduous (leaf shedding) trees are perfect for 5mm and C6 lights and Evergreen trees are best suited to C6 lights. Large Evergreen trees should be wrapped in C7 and C9 Christmas Lights. Pro Tip: For large trees use an 18’ extension pole and a thick car washing brush to make the job easier. Vertical wraps are popular with large evergreen trees and offer a completely different effect. Starting at the top of the tree, anchoring to a strong branch, all strands fall to the base of the tree. Be sure to space the strands evenly. These types of installations are best with large bulbs (C7/C9) Pro Tip: If you can’t get to the top, don’t worry. Simply connect the strands at the top and at night no one can see that you’re not reaching the top of the tree! Trunk and limb wraps can bring deciduous trees to life once the sun sets. This involves tightly wrapping the trunk of the tree and certain limbs with light strings to bring out the tree’s unique shape. The best lights for this option are 5mm and C6. Pro Tip: Do not overlap strands too much or it will take an extremely long time to take down. Rather, use multiplugs at the base of branch sets and feed off them. Light Knights also offers custom made Christmas Light balls that are hung from high points in the tree. When lit up at night they offer a very unique ‘hovering sphere’ effect! We highly suggest them! Do you have any questions regarding installing Christmas lights? Get in touch with us through our contact page. Christmas light installation season in Vancouver is around the corner and it can be confusing knowing which bulbs to use on what areas of your home. Many sizes and shapes of holiday lights are available to consumers today. They vary from 5mm wide angle strings, C6, C7, C9, globe shaped, falling snow LED tubes, all the way to bulbs shaped like icicles and various other designs. We know it can be confusing trying to make your way through all these options, that’s why Light Knights have dedicated designers and seasoned installers to help make your holidays beautifully lit and hassle free! Below, we will go into detail the different bulb sizes and their best uses. 5mm A light that is perfect for wrapping branches and trucks. They have a crisp sharp look to them. Additionally, these lights are good for deciduous trees as the lights are able to shine through the bare trees. M5 The M5 lights are a diverse light that can be used for trunk and branch wraps, deciduous trees and small evergreens. These lights also work great on wreaths and garlands. C6 The C6 lights are a bright light that is good for small evergreens and large deciduous trees. Additionally, double wrapping these lights can provide a great effect to one’s homes roof lines. C7 Generally used for homes roof lines the C7 lights provide a a bright larger bulb with 3 LEDs inside. Applications include commercial buildings and large evergreens. C9 The C9 light is a great light for home and commercial building roof lines. These lights are able to be installed in perfectly straight lines giving a crisp clean look. From time to time these lights will be used for large trees of the 30’+ variety. Globe Shaped G12 globe shaped lights are a great light for party’s and weddings. Their round globe shape provides a perfect balance of light creating a nice ambience for any gathering. These lights can also be used for trees and bushes. Falling Snow A great light for commercial applications in parking lots and over walkways. 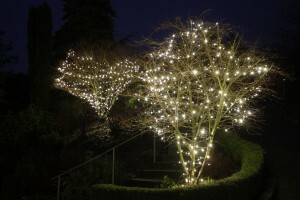 These lights are also a great addition to a tree lit up with 5mm lights.